The horse, the cow, and the camel are the three most important animals in the history of the world. Without any one of them, the story of humankind would have to be rewritten. Without the camel, the story of Islam and the Arabian Peninsula as we know them could not have been written. Without all of them, our world would be a much different place than what it is today. Thankfully for humanity, we have been blessed with all three. In August of the same year they made their claim, I was introduced to a man who had recently established a trading company doing business in what was then still the Soviet Union. When he handed me his business card, I noticed that the logo consisted of the image of a two-humped Bactrian camel. Surprised, I asked him why. I agreed with him on the camel being the perfect symbol of trade, but disagreed with him—albeit silently—over his choice of camels. The one-humped Dromedary or Arabian camel would have been a far better choice to my way of thinking than its two-humped cousin from Central Asia. The Bactrian, admittedly, was well-suited for traipsing across the cold climate deserts it faced like the Gobi, while the Dromedary was custom-tailored to negotiate the hot climate deserts of Arabia. Neither would have thrived as they did had they traded places. Realizing that it was his trading company, after all, and not mine, and that he was an émigré from the Soviet Union with roots stemming from the Uzbekistan Soviet Socialist Republic in Central Asia where the Bactrian camel had once held sway during the glory days of the Silk Road, I left him and his camel alone. According to paleontologists, the earliest recognizable ancestors of the modern-day camel appeared in North America during the Pliocene or early Pleistocene age some 3 to 5 million years ago. Those proto-camels migrated north to Alaska, where they crossed the Bering land bridge to Asia. From there, they spread westward across the Eurasian landmass, with their distant offspring eventually reaching Southwest Asia and North Africa. A recent DNA study has concluded that one-humped Dromedaries were first domesticated around 1000 BCE in the Southeast Arabian Peninsula, while others have dated its domestication to a much earlier time—to around 2000 BCE in an area somewhere east of present-day Yemen. In either case, the Dromedary was relatively easy to tame, scholars have argued, coming as it did from a largely predator-free environment. That same DNA study found that the genetic makeup of camels has remained diverse throughout their geographical range ever since. This is thanks primarily to the constant back-and-forth flow of trade caravans, which kept the various strains of camels in regular contact with one another, thus assuring the repeated intermixing of their varied genetic make-ups. In some isolated regions, “thoroughbred” camels were selectively bred to emphasize specific features that helped them adapt to their particular surroundings—adaptations such as, for instance, hard feet to better negotiate rugged, stony mountain trails. When the camel first arrived on the Arabian Peninsula and North Africa, it came in varied strains. Eventually, other strains died out, while the Dromedary survived, thanks to how much better it adapted to its hot desert living environment and how useful it proved to the humans living there. Certain physiological adaptations present in Arabian camels stand out: 1) two sets of eyelashes, better protecting their eyes from the desert sun and wind-blown sand; 2) large, occludable nostrils, giving them the ability to keep inhaled air warm and moist, and to extract moisture from their breath as they exhale; 3) highly-concentrated urine, minimizing water loss during urination; 4) the ability to excrete high concentrations of salt during urination, making it possible for them to drink highly salinated desert water unfit for humans or other animals; 5) a highly-refined system of regulating its body temperature, allowing it to withstand the fierce desert heat without sweating; 6) a system of water storage distributed throughout its body and not concentrated in just one or a few places, enabling it to store vast quantities of water and go without replenishment for a week at a time in the hot climate deserts frequented by the Dromedary and for a month or longer at a time in the cold climate deserts frequented by the Bactrian; 7) and, of course, its signature hump, providing a large storehouse for fat that kept the camels energized for long periods of time. Added to that, female camels are capable of producing over one gallon of high fat, high protein milk on a daily basis for up to 11 months out of the year, even when working in a caravan, providing wholesome nourishment as a bonus to their service as pack animals. Given the precarious conditions surrounding camel procreation and the vital need to assure the continued propagation of the species, breeding females were highly prized and their sale was forbidden. Breeders could never get enough of them. When there was an overstock of males, on the other hand, unwanted extras were often sold, or castrated and put to work as the lowliest of pack animals, or sometimes slaughtered for food. The camel’s inestimable value led to a long tradition of camel raiding among Bedouin tribes. The tribes incorporated such raids into their value systems, and the brave men who successfully carried out such raids—replenishing tribal herds while diminishing those of their enemies—were greatly venerated and raised to positions of prominence. And there were camels aplenty to pilfer. One wealthy tribe in 19th century Arabia is estimated to have owned between 40,000 and 50,000 Dromedaries. It’s been reported that the sound of tens of thousands of camels gathered around an oasis or well was something akin to that of rolling thunder. With the camel’s remarkable endurance, striking strength, and many adaptive qualities, it was the perfect means for transporting goods long distances across unforgiving, inhospitable stretches of desert where wheeled vehicles would have utterly failed. The largest caravans were comprised of as many as 3,000 camels. With each one carrying an average of 500 lbs., that meant that such a caravan could carry up to 1.5 million lbs. of cargo, most of it goods for trade. Translated into present-day 40-foot ocean containers, that is the equivalent to as many as 34 containers filled with merchandise. Initially, humans prized camels as a source for meat and milk for consumption and hair for weaving. Later, for many centuries, they were used primarily as beasts of burden for carrying loads, not as mounts for humans to ride on. An Arab trader at the dawn of the Common Era likely was borne by a donkey, not a camel, as he traveled with his caravan, while the Dromedary was left to carry his goods. Later, as the design of camel saddles evolved, they became more efficient, effective, and comfortable, making it easier to harness the camel’s potential as a means of human conveyance and an instrument of war. The great 14th century CE Arab historian Ibn Khaldun recognized the importance of the camel to desert nomads, whom he portrayed as virtuous and praise-worthy in comparison with effete city-dwellers. Camels played a major role in enabling the Islamic conquests. With the discovery of oil in the 1930s and the ensuing modernization of the Kingdom, the camel’s position at the center of Arab life diminished—the lamented reality noted by Youssef Ibrahim and Mansour Fares Hussein nearly 30 years ago. Published numbers call for a modest modification of their argument. Saudi Arabia had an estimated 1.4 million camels in 2017, an increase from its previous numbers according to Dr. Fahad Bin Abdullah Al Samawi, Secretary General of the Riyadh-based King Abdul Aziz Foundation for Research and Archives. The Dromedary has not disappeared from the KSA scene; what it has done is assume a new place in Saudi society. One sign of the New Age of the Camel are the hotly-contested camel beauty competitions being held in the Kingdom and the Gulf States. The largest such contest is the annual King Abdulaziz Camel Festival held in Al Dhana. Thirty thousand camels took part in the most recent festival, hoping to be judged the fairest of them all based on such factors as height, shape, hump placement, lips, ears, and more. Prize money totaling 57 million USD testifies to the seriousness of the competition. Over 300,000 visitors attended the festival early this year, ogling the competing breeds. Top camels sell for over 1 million USD, a further indication of the undying popularity of the Dromedary in the Arab world. 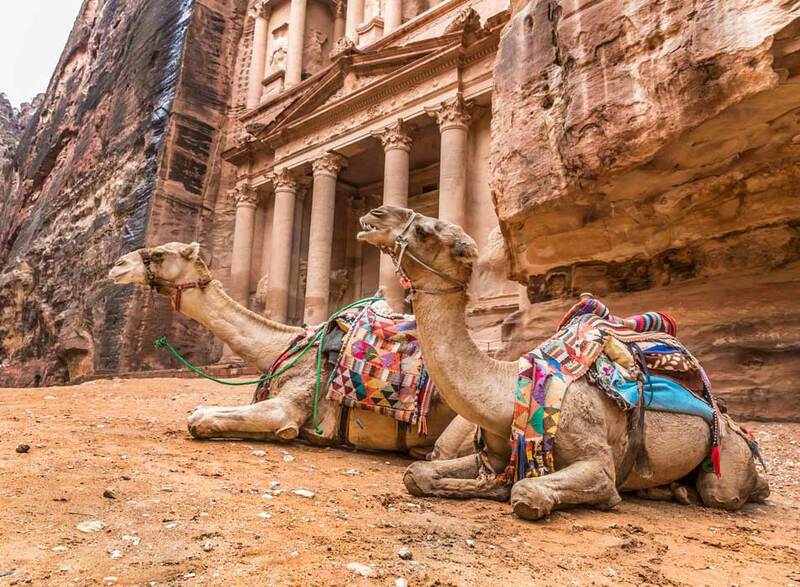 The traditional labors of the camel may have been largely taken over by trucks and trains and automobiles on land and by ships at sea, but its place in the history and lore of the Kingdom is timeless.